Le tonnerre - thunder - is rumbling heavily, fast approaching. It is as if someone is rolling around bones above or moving a grand piano from one celestial room to another. It can happen sometimes with the heat in Provence where the pressure will build until loose, messy storms break out. They are predicted for today, have been predicted since morning actually but it was only a little while ago that I picked my head up from an article I am working on to notice that the sky had darkened and the swallows were swooping extra low. So I fed the dogs early and took them out just in case. My espadrilles are broken in to the point of being broken and so I have to pick myself carefully along the rock-strewn path. Sapphire-bodied dragonflies hovered like drones over powderpuff clover, wings beating so fast as to be invisible. I closed my eyes for just a moment to feel the breeze skimming across the beads of perspiration on my forehead but then another boom rang out, closer, and Ben, my sweetest Golden, looked at me with eyes shining in panic so we stepped up the pace home. Despite the heat, I had stepped back on the yoga mat this morning. Just pointing my red-tipped toes towards it and then placing one foot then the next was like slipping into a pool. It is familiar. Somewhere - I think it is my Sister who has it - there is a beaten up, faded photograph of my Mom giving yoga lessons on the front lawn. Robin, my Sister, is doing a pretty good copy of my Mom's pose but me, the littlest and probably only five at the time was doing something entirely of my own make. I might have added this into my memory but I seem to recall me giggling at how funny I was being. Today I told myself to go slowly, which felt appropriate as if I was parting the thickness of the air with my arms and legs and breath. For you see, it had been quite a while. And this for an act which does me a world of good, one that I usually say strips me down to the best of myself. Age is not something that I tend to concern myself with much. But lately, my body has been telling me that maybe, just maybe, I need to be a tiny more specific. I am not the only one. My friend DA has written a really excellent piece for the Huffington Post that circles around and pin-pointing some of the same ideas that have been ringing in my head as evasively as the thunder. To me that is some of what the best of this odd internet world can do - a little lineup of gentle pinpricks of thought or ideas - that can help even the most heat-addled of us play connect the dots. So I stepped back on the mat. Despite the house shutters clanking and the olive tree branches swaying like the sea below my window, I think that the storm has passed us by. I have been sitting next to Ben in the shower of the guest room - his fear fort - for the past fifteen minutes but something imperceptible shifted in the air so I got up to see. The sky is a soft orange in the distance - but in the opposite direction now. Maybe the heat lightning is cracking its whip over there, so quick and passing but I wonder if it is waking something up in someone else's heart as well. Beautiful words and photos. You captured the approaching storm very well. I'm longing for some storms to skip this way but we probably won't see any for months and it makes me a bit sad. These photos look like paintings and I am in love with your final words. Yes, stepping onto the mat after so long... something I need to do in a different area. I may be good about diving into the pool three times a week but am loaded with reasons (aka "excuses") for not maintaining a writing practice -- even just for myself. 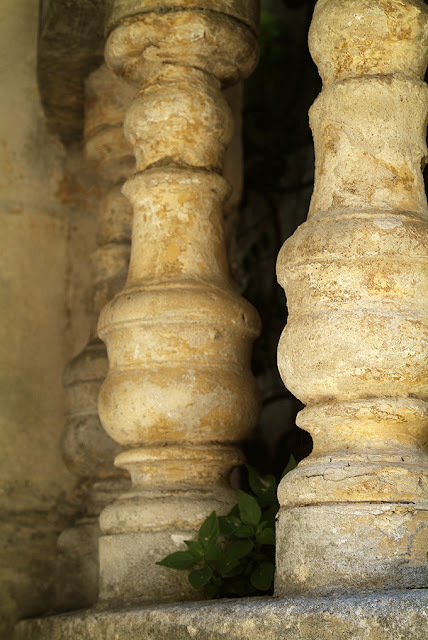 It won't happen on its own and one can't wait for inspiration to strike, one has to invite it in by opening the door as often as possible — as you demonstrate with your ever-growing body of work on this blog. Judith, that was beautifully expressed - thank you!!! And proof (if any was needed for it certainly wasn't for me) of what a fine writer you are. But I understand. Just like with my yoga, there are phases for everything. I have wondered where your blog has been though and am sure I am not the only one! And I agree, you just have to keep going. I had no idea what I was going to write yesterday but knew that I wanted to stick to my Tuesday and Friday posting as much as possible - glad something came out!! I'm not disciplined, even though it also does me a world of good. Thanks for the reminder to get back on the mat. Are you when it comes to painting?? The thunder nand lightning remind me of the Midwest, Michigan, particularly. Nature expresses her language of involvement, in beauty or fear and can disturb meditative silence and poses. Life consists of four seasons which sometimes overlap. One season can seem so short or can linger.I guess regrets are like spurs looking for meanings. 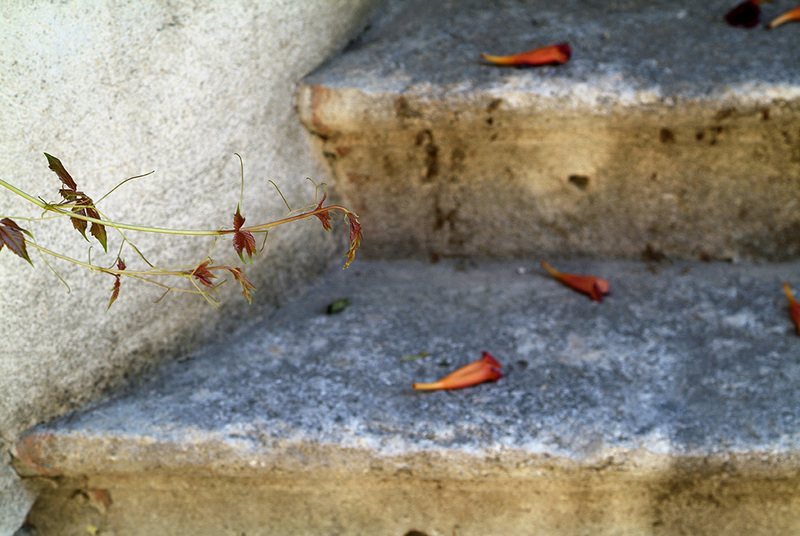 The petals strewn on the stairs look romantic. And yes, there is much of Michigan in this current weather. So capricious!! As for seasons, here we have virtually no spring or autumn usually - that is why I really loved our drawn out spring this year. I like what you say about regrets - but wish that I didn't feel the need to find meaning in everything, all of the time! Oh, that final thought just made my heart sink. How glad I am that they found their way to you! I think you know that Kipling is our rescue dog. He usually covers up his fear (towards people, other dogs) by thrashing out (never with us or Ben) but even he came to cuddle up next to me in the guest bath yesterday. It was crowded in there! After I put on some relaxing ambient piano music and it seemed to help them both. Leslie, that is phenomenal that Henry and Bob listened to you enough for you to get them home! Wow. I have been in similar situations with Ben and it is touch and go and very,very scary - certainly when we lived in Arles and his beeline for home meant running out into traffic! Now he will listen to me enough that if I say "sit", amazingly he will sit and that will usually give me enough time to reach him and put on his leash. Good Boy. I can't remember if I wrote about last 4th of July? I was at my Mom's in the States and volunteered to stay home to keep an eye on Sweetie - her gentle giant of a rescue - because he is petrified of fireworks. Well, Michigan laws state that you can set off even the huge fireworks and it truly was like a warzone. Finally, once he got into the bathtub I could at least get him to settle in but it was heartbreaking to see him like that and it lasted for so long. I am hoping that they will go to my Sister's place in the country this year because it is so loud that honestly I don't even think that sleeping pills would work. Back from Paris and missing it I decided it was time to resume my Tai Chi class to get mysel grounded again! After 1/2 an hour I was drenched like I had been in a monsoon, but a sweetly, softly flowing Yin and yang. I know after my month absence from classes (which I had just barely started before our trip) that I will be sore tomorrow, but I think it will be "a good sore." Your words today had me out scurrying with the dogs to miss the downpour and then to stay nearby to Ben -what a treasure you are for each other! That awakening. Whatever triggers it, we need it. At some moments in life more than others. Nature can be such a powerful reminder of how small we are, in a good way. This is a gorgeous invitation into your physical and emotional world, Heather. And inspiring to me on many levels. Oh I am so glad - it is the least I can do because your pieces make think and rethink and then come back at a subject again and again...I am so grateful for all that you do. I am sorry that you are scared of rain and thunder but think it is a good thing that you live where you do so at least you don't have to encounter the big storms very often. I find storms beautiful but having grown up in the Midwest they do freak me out a bit when they are super powerful. And it is SO hard to see with the dogs. There is so little that I can do that is actually effective. Dear Heather, I love your writing. This was one of your best! very poetic and atmospheric! Hope poor Ben got over his fear soon enough! Your thunderstorms have been saving up for Greece. We can almost set our watches these days by when the clouds covering the mountain top start churning towards us - the thunder a drumroll - announcing that soon huge raindrops will be falling. Each day they say, "This is the last" and hopefully one day it will be. Thanks for your recent visits to Travelnwrite, I think of you and your village life when I write of ours. Thank you so much for your comment on my blog earlier today! What a beautiful post, I love your description of the thunder. I've never heard thunder like that we've had here in the last week, I've been spending a lot of time sitting under the sun shades watching the sky in awe. I also love your description of yoga, I've been trying to get back into doing it regularly while I've been in France but my god, it's hard to motivate myself, even when doing it makes me feel so much better. Hasn't the weather been crazy? We tend to get these big storm at the end of August but now? Does that mean that we will have them again later on too? I can't even enjoy them since I am on Dog Caregiver Patrol but I can see that the skies are darkening and that there might be one more coming this afternoon. PS. I know that even though you have already be an expat many a time, if you need help with anything Frenchy wise don't hesitate to email me ... robinsonheather (at) yahoo.com !